This is something I've been meaning to try for ages. I love the way the camera iris works, a small turn of the iris ring and the central hole expands or contacts. Camera irises have varying numbers of vanes, the more vanes, the closer the resulting hole is to a circle. In this prototype I've used five vanes, a reasonable balance between a nicely circular hole and having loads of fiddly bits to cut out. Next step is to make a slightly larger prototype where the hole is larger in relation to the surrounding rim. I might also try different numbers of vanes just out of interest. I'd like to add the iris to the top of a gift box to make an interesting closeable container. Do you have any other ideas how it could be used? Leave a comment! I'm so into paper pinhole cameras these days and just thought, if you can make it close completely, you can use it as a shutter mechanism which looks great. I have to agree with lunchweek. Pinhole cameras are unique and can create exciting results. 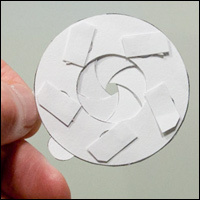 If you did decide to design your own pinhole camera, you could do a 'cheat'. Make the iris decorative and appear functional. Have the same action that opens the iris, lift a cover for the pinhole itself. Then if the flap does not come down smoothly, the iris can buy you time to get the flap properly closed. Sometimes I think random thoughts. It failed miserably. I'm excited for this one though! So far I've never known one of your models to be impossible. 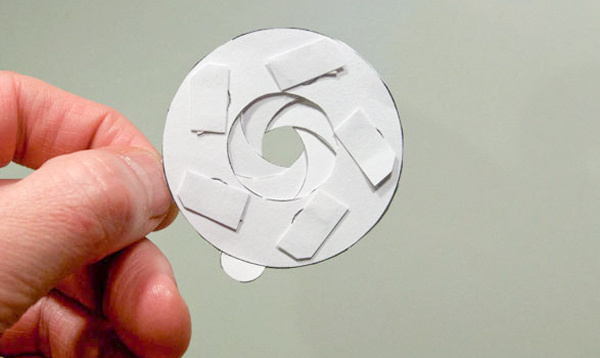 Have you heard of the origami piece called "Spring into Action"? I was thinking perhaps you could link one end to this iris so that when you twist the ring one way, the spring extends and vice versa. Well combine the iris with a "lipstick screw" mechanism and you have a Rob Ives character show piece. Otherwise cyclops comes to mind. Or the dog with the big eyes in the Tindebox by H C Andersen. Don't know how practical these suggestions are though. This looks great on its own. This looks great on its own. But what about combining it with one of your fabulous lock mechanisms to make it the door to a safe? And I like Smelter's idea too! Your fans are right. You have discovered a foundation for a hole series of models. There are bound to be hundreds of things you can combine with the Iris mechanism. The trick will be in choosing the right combinations. And then of course you will want to pick and choose based on complexity, difficulty, and build time. Keep up the good work.